Jaguar is proud to announce the all-new 2009 XF - a stunning four-door Jaguar that combines the style and performance of a sports car with the refinement, space and sophistication of a luxury sedan. Scheduled to make its world debut at the 2007 Frankfurt International Motor Show in September, the new Jaguar XF is a reflection of the bold new design language that Jaguar will be using both now and in the future. "As one of the most visually striking, technically sophisticated and driver-oriented sedan cars that Jaguar has ever produced, the XF clearly demonstrates the forward-looking focus that now defines the Jaguar brand," said Wayne Burgess, XF Senior Design Manager. "With its dramatic styling, powerful flowing lines and a distinctive front, the new XF looks like no other Jaguar . Yet it defines the new design language the company will be adopting for all future models." The first impression of the new XF is its visual strength. It firmly emphasizes contemporary automotive style whilst maintaining Jaguar's core values. The new XF is sporty, muscular and dynamic -- made evident in its sweeping silhouette that was inspired by the new Jaguar XK sports car. There is a powerful grille, dramatic side window graphics and, of course, strong Jaguar rear haunches. 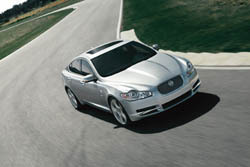 The stance of the XF gives the car a 'ready to pounce' look that suggests latent power and energy. The contemporary design theme is continued inside the XF with an interior ambience that is enriched by wood, aluminum and leather presented in a very modern way, unlike any other car manufacturer. With its sophisticated instruments and calm interior mood lighting, the XF moves away from traditional styling to a contemporary, sporting luxury theme. This is emphasized by features such as the all-new JaguarDrive Selector TM, JaguarSense TM (an electronic control system that employs motion detecting sensors to activate certain vehicle features), unique phosphor blue interior lighting, and Bowers & Wilkins sound technology. The new XF will be available in the US with a choice of two engines – a 4.2-liter naturally-aspirated V8 and a 4.2-liter supercharged V8. In naturally-aspirated form, the XF develops 300bhp and 310 lb.-ft. of torque. The supercharged version uses a highly efficient rotor-type supercharger that develops 420bhp and 408 lb.-ft. of torque. Both engines combine effortless performance, unrivalled character, an impeccable pedigree, and have a classic Jaguar blend of power and refinement. The XF is a four-door Jaguar that combines the style and performance of a sports car with the refinement, space and sophistication of a luxury sedan. The exterior styling of the XF is the first result of Jaguar's new design language in a sedan. With interior design that is the equal of the exterior in terms of crafted execution and visual excitement, the XF offers a truly contemporary, luxury environment. The coupe-like lines of the XF belie the amount of space inside: there is room for five adults in comfort, generous interior stowage and a trunk capacity of 17.6 cu. ft. (500 liters), plus the opportunity to fold down the rear seats and add a further 14.8 cu. ft. (420 liters). Jaguar craftsmanship adopts a sharp new edge on the XF. Sophisticated instrumentation, a touch-screen, modern materials and graphics complement new ‘surprise and delight’ features. Upon entry to the XF, the start button pulses, like a heartbeat. Start the engine and the JaguarDrive Selector TM rises into the palm of the hand, while rotating vents turn from their flush, 'parked' position to their functional open position. Improved torsional stiffness delivers refinement and dynamic performance – underpinning the driver-focused yet remarkably comfortable driving experience. The XF will be available from launch in the U.S. with two different engines – 4.2-liter naturally-aspirated V8 and 4.2-liter supercharged V8 – all featuring Jaguar's proven six-speed automatic transmission with steering-wheel-mounted paddles for manual gear selection (Jaguar Sequential Shift TM) . Key driver aids on the XF include Electronic Brake Assist, Electronic Brakeforce Distribution, Anti-lock Braking System, Dynamic Stability Control, Cornering Brake Control and Engine Drag Torque Control. And, for the first time in a Jaguar, Understeer Control Logic which decelerates the car and helps to restore grip to the front wheels when required. Three trim levels will be offered in the U.S. market – Luxury, Premium Luxury and Supercharged levels. The first cars will be delivered to U.S. customers in March 2008. Pricing for the North American market will be announced in November 2007.